The river Kwai is one of the most fabulous tourist destinations in Thailand alongside Kanchanburi, the largest town, situated on the banks of this famous river. Kanchanaburi, one of the most beautiful provinces of Thailand, is located about 128 km west of Bangkok (roughly 2 1/2 hours drive). The town of Kanchanaburi is located at the point where two tributaries, the Khwae Noi (River Kwai) and Khwae Yai meet and form the Mae Klong River. A day's tour to Kanchanaburi and River Kwai can give you the historic experience of visiting the world renowned bridge over the River Kwai and the cemetery, of the allied prisoners of World War II. You will also have the opportunity to take a train ride along the historic Death Railway. The River Kwai, also known as Khwae Noi and Khwae Sai Yok, flows along western Thailand, which borders Myanmar. It begins at the confluence of Ranti, Songkalia and Bikhli Rivers and merges with the Khwae Yai River at Kanchanaburi to form the Mae Klong River, which empties into the Gulf of Thailand at Samut Songkhram. The River Kwai is chiefly known from the Pierre Boulle novel and the David Lean film, “The Bridge on the River Kwai”, which depicted the Australian, Dutch and British prisoners of war forced by the Japanese constructing two parallel bridges spanning the river as part of the Burma Railway, also known as the Death Railway. It earned this horrifying name due to the many lives lost in its construction. One of the bridges was wooden and temporary while the other, which still exists, was made of concrete and steel. The bridge was the target of frequent bombing raids by the Allied Forces during World War II and was rebuilt after the war. The curved spans of the bridge which are the original sections have been retained. A daily train is still takes passengers and tourists through the historical route from Kanchanaburi to Nam Tok Sai Yok Noi railway station. River Kwai is a main river of Kanchanaburi. The banks on either side of River Kwai are adorned by a variety of rich flaura, making it ideal for peaceful rafting, absorbing the natural atmosphere along this historical river. 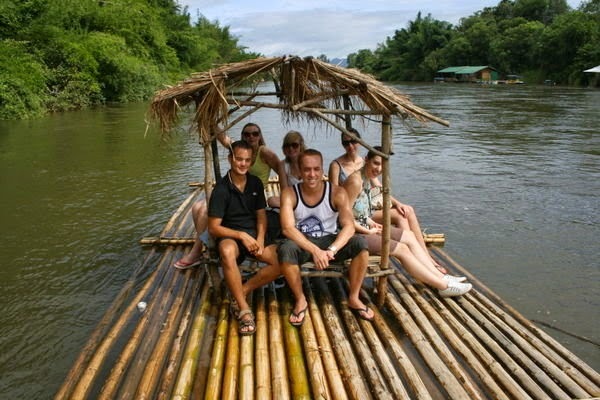 Gently sailing downstream over the River Kwai passing beautiful, unspoiled scenery of trees and mountain ranges can be an experience that you would cherish all your life. The starting point is at the Bridge over the River Kwai. As you sail, you will have a magnificent view of the Bridge, if you turn back to see, which is especially beautiful when the train passes by. You’ll first pass the city area which has a lively look with number of resorts and restaurants lined up along the riverbanks, after which you will enter the calmer regions where you can see traditional houses, fishing boats and people leading simple ways of life. Another exciting idea would be canoeing, for which you can board at the banks of Kwai Noi River and slowly paddle along while admiring the delightful landscape. The River Kwai is left to flow gently on weekends but during the weekdays more water is let out from the Khao Leam Dam (Vajiralongkorn Dam) ---the time to go canoeing! 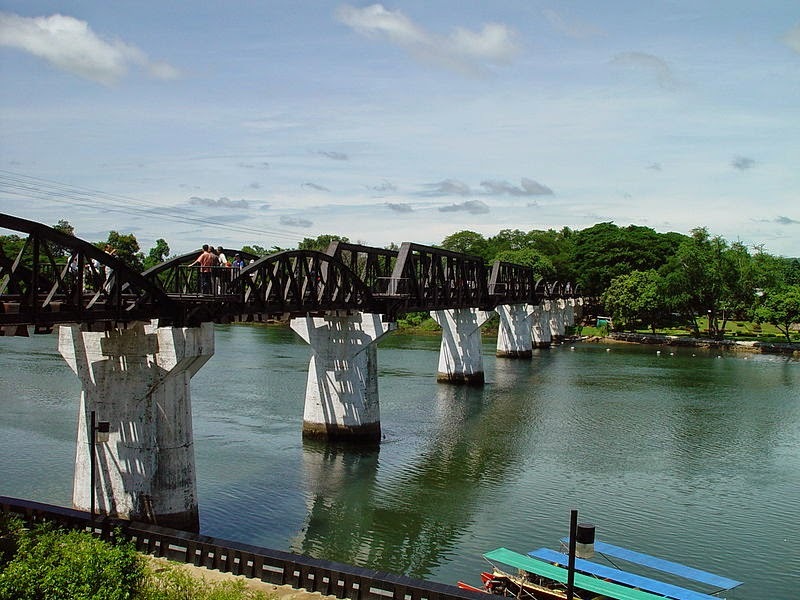 Tourists can take a walk along the rail on the Bridge over the River Kwai from which you can gaze at the beautiful river and the houses on the outstretched riverbanks. At the foot of the bridge, you can have a look at the old locomotive displayed belonging to the time of the World War II. You may also want to visit the War Museum, a private Museum that has a collection of numerous World War II Stories and artifacts, such as war instruments, photographs, uniforms, etc. the museum also houses an Art Gallery on the 2nd and 3rd floors. The paintings on the second floor relate ancient battles between the Thais and Burmese, while third-floor murals tell the Thai history and provide portraits of prime ministers as well as other important political figures. This private museum also features Khmer-style woodcarvings, a pair of elaborate Burmese Buddhas, and excellent paintings of Chinese deities. Since a large number of Thai and foreign tourists come and visit the Bridge, Kanchanaburi province, in co-operation with the Tourism Authority of Thailand and The State Railway of Thailand, decided to organize The Bridge on the River Kwai Week to commemorate the construction of the railway of death and the Bridge of River Kwai which enhances tourism in the area. The first fair was held in 1980and has been held annually since then. Various activities such as open theaters to entertain visitors, exhibitions of pictures of World War II and local crafts are held at the venue. The stalls there sell handicrafts and local food products for everyone to truly experience the festival. Yet the hallmark of the fair since its beginning remains the light and sound programme on the story of the construction of the bridge and the air raids by the Allied forces. To simulate the atmosphere of the time, a steam train of World War II days even appears in the scene and transports visitors along the railway of death, crossing the Bridge on the River Kwai to Sai Yok.